Every 10 years the nation is shaken by a massive political recalibration.That’s because the national census requires a redrawing of political lines based on population growth and population shifts. This year, Hispanics will play a major role in national redistricting, a result of the 2010 census. The nation’s Latino community increased a whopping 43 percent between 2000, the last time there was a national headcount, and 2010. The expansion of the Hispanic community means Latinos accounted for more than half of the nation’s growth in the past 10 years. And it means this is the first time redistricting occurs when Hispanics are the largest minority group in the county. That poses both a challenge and an opportunity for Latinos as the nation’s new political maps are drawn that set boundaries for the areas from which the nation’s leaders will be elected. In many places, redistricting will pave the way for the election of new Hispanic office holders and increase Latino representation at the local, state and federal level. There’s evidence the process has also energized Latinos to become more involved in local politics. “The census numbers have encouraged Latinos in a way nothing else has,” said Angelo Falcon, president of the New York-based National Institute for Latino Policy. But sometimes there’s little will to redraw political lines to empower Hispanic voters.In Houston, for example, two new city council districts were created because of the city’s rapidly growing population, largely because of a surge of Hispanic residents. But neither of the new districts holds a majority of Hispanic voters, drawing criticism from Latino advocates. “There are parts of this nation that are resistant. But what we keep telling people is that the Voting Rights Act is alive and well,” said Steven Ochoa, the National Redistricting Coordinator of the Mexican American Legal Defense and Education Fund (MALDEF). The Voting Rights Act, a federal civil rights law that dates from 1965, bars the dilution of the voting power of minorities and resulted in the creation of dozens of Hispanic majority and black majority political districts. The act also requires certain states with a history of discrimination against minorities, including Texas and most of the Deep South, and counties and cities in other states to submit their redistricting plans to the Justice Department for approval. For Ochoa, lawsuits under the Voting Rights Act is a way to push back against the efforts those who don’t want new Hispanic majority districts---including incumbent office holders who might be hurt by the redrawing of political lines and non-Hispanic voters who don’t want to become minorities in their political jurisdictions. “MALDEF is prepared to sue,” Ochoa said. While advocates like Ochoa have the Voting Rights Act as a weapon, the slogan of Latino redistricting activists is “communities of interest.” “Redistricting is about empowering our communities,” said Astrid Garcia, Director of State Election Policy and Redistricting at the National Association of Latino Elected Officials(NALEO). The organization has rolled out a major effort this year in California, Nevada and Florida, where it’s trying to get Latinos to local redistricting meetings to make sure Hispanic communities aren’t split up. They argue that “communities of interest,” or communities with the same ethnic heritage, must be kept whole so they can successfully address common concerns. “The way district lines are drawn could empower the community or take power from the community,” Garcia said, adding that 90 percent of the California’s growth in the past 10 years was due to the expansion of the state’s population and she wants that reflected in local offices, the state house and Congress. Her job is to get Latinos to the meetings California’s 14-member redistricting panel held all over the state. Besides multiplying, California’s Latinos have also moved to areas of the state where Hispanics have never been much of a presence, Garcia said. They’ve spread from Latino strongholds in Los Angeles and other coastal areas and inland towards San Bernadino, Riverside and other places that traditionally vote for Republicans. Latino voters lean Democratic. “Whether this changes the political balance of these areas, we don’t know,” Garcia said. “But we have to make sure their votes count.” MALDEF is also working on the grass roots level to help Latino communities influence redistricting decisions. And it’s gone a step further, actually drawing its own political maps. Texas grew so much during the last decade it will get four new congressional seats. Hispanic advocates hope Latinos fill at least two of them. MALDEF’s proposed Texas map would create two new Hispanic majority congressional districts, one in the Dallas-Fort Worth area and the other in the Rio Grande Valley. “The districts unite populations with substantial economic and social commonalities; ensuring that the millions of Latinos who make up the communities represented will have a strong and effective voice in Congress,” said a MALDEF statement about its Texas map. The organization hopes it has some clout in Texas since stopped the state’s previous attempt at redistricting, suing under the Voting Rights Act and winning at the Supreme Court. MALDEF’s map for Illinois would add some Hispanic-majority statehouse districts in the Chicago area. But Gloria Montaño, director of NALEO’s Washington D.C. office, stressed that a district does not have to have a Hispanic majority to empower its Latino voters.“Some people will think that Latinos will be represented at 25 percent, some people think they will be represented at 75 percent,” she said. That brings up the tricky situation in Nevada. The state’s population grew so much in the last 10 years---once again, thanks largely to Latinos---that it merits a new congressional district and will have four representatives to the U.S. House in the next Congress. But there’s a bitter debate whether that new district should contain a majority of Hispanic residents. Some advocates argue a Hispanic-majority congressional district would allow the community to send a representative to Washington who would champion their priorities, like immigration reform. Republicans also like the idea of a new Hispanic-majority district because it would concentrate the state’s likely Democratic voters in one place and make it much easier to keep the state’s three other congressional districts in GOP hands. But Democrats and some Hispanic advocates argue Latinos should be scattered throughout the state, to make sure all Nevada members of Congress took their concerns into consideration. If Nevada’s Latino population were just a bit larger and more concentrated, there would not have been this debate because the Voting Rights Act would likely require the state to draw a Latino majority district. But for that to happen, it must be possible to draw a district in Nevada where 50 percent of the voters are Hispanic. The census determined that one in four Nevada residents are Hispanic. But children and non-citizens who can’t vote make up too much of Nevada’s population. So it’s impossible to draw a cohesive, compact district where the majority of voters are Latino. “The reality is that the Latino community isn’t large enough in Nevada yet,” said MALDEF’s Ochoa. 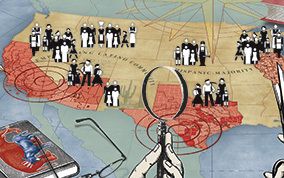 Nevada’s final redistricting map was not determined as this issue of LATINO went to press. But regardless of what happens in Nevada, Latino activists are hoping to increase the number of Hispanic lawmakers in Congress, now 25 in the House of Representatives and two in the U.S. Senate. Ochoa is confident Latinos have positioned themselves in state legislatures, county councils and other places across the nation and will influence the way the nation’s new political boundaries are drawn. “Latinos have been permeating the decision-making bodies across the land,” he said. If the political lines are drawn as advocates wish, there will be opportunities in 2012 to send elect new Latino House members in California, Arizona, Texas, Colorado, New Mexico, Illinois, and Florida. “There’s plenty of opportunity for us,” said NALEO’s Montaño. The 2010 census revealed there are more than 50 million Hispanics living in the United States. New Mexico, Texas, Arizona, Nevada, Florida Colorado, New Jersey, New York and Illinois have the highest concentrations. But in 27 states and the District of Columbia, Latinos now comprise at least 8 percent of the population. That’s prompted redistricting fights in some unlikely places. For many, Georgetown, Delaware is a quaint little town you pass on the way to the seashore points on the Atlantic. But the population of Georgetown, the seat of Sussex County, grew by nearly 40 percent to about 6,400 people in the last decade, thanks largely to the booming Latino community in that area. Those Hispanics, many of them Guatemalans who came to work in the area’s poultry industry, helped make Latinos 8.2 percent of Delaware’s population. But Latinos are woefully underrepresented in the state legislature and city and county councils. In Georgetown, the struggle is to keep the new political lines from splitting up the town’s Hispanic community. “It’s not right that your neighbor across the street can’t vote for something you care about,” said Sandra Bucay, president of the First State League of Latin American Citizens. She’s part of a task force that includes the Delaware League of Women Voters and the ACLU that is trying to make sure the state legislature develops a redistricting plan in Delaware that keeps similar communities and ethnic and racial groups together. “We want to make sure the census is used correctly,” Bucay said. Georgetown’s population is about 30 percent Latino. But there are other places that have not had traditional Latino populations and now have Latino majorities. They include Grand Rapids, Michigan; Oklahoma City, Oklahoma; Madison, Wisconsin and Omaha, Nebraska. The kind of activism that’s playing out in Georgetown is also evident in those larger cities and dozens of other communities across the nation. Besides feeling strength in numbers, Hispanics are feeling the heat of the nation’s anti-immigrant fervor, noted Falcon of the National Institute for Latino Policy. That’s also pushing more Latinos towards political activism. “They see the importance of getting even more involved politically,” Falcon said. But the issue is playing out state by state and even county by county and town to town. That’s because each state’s redistricting efforts are different. Most of the new political lines will be drawn by state legislatures, which usually results in maps that protect incumbent politicians. But some states have set up independent boards and are trying other reforms. That gives Latinos in reform-minded states like California and New York a better chance of having their voices heard. Ana Radelat lives near Washington, DC and writes about politics and other things.